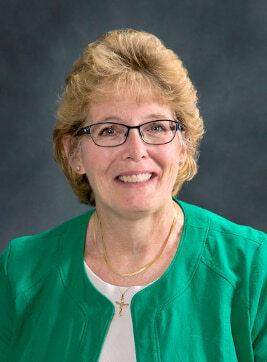 Kathy Rideout has served the School of Nursing community for more than 30 years as a nurse practitioner, teacher, scholar, and administrator. She was named dean in 2012 after a one-year stint as interim dean and seven years as associate dean for academic affairs. As dean, Rideout has presided over a period of substantial growth in the three missions of the school: education, research, and practice. She has also been a champion for diversity issues – both on the faculty and student level – and has been an influential voice in national discussions on interprofessional education, nursing school leadership, and the future of nursing education. Among her successes has been the creation and expansion of the Center for Employee Wellness and the development of several new academic programs, including the Master’s in Nursing Education and Care Management Education program. Under her tenure, the School of Nursing placed in the top 40 in the best graduate nursing programs and best Doctor of Nursing Practice programs, according to rankings by U.S. News & World Report, and placed No. 19 among all nursing schools in the National Institutes of Health ranking. In 2016, Rideout was honored for her commitment to issues of diversity with a UR Presidential Diversity Award. Under her leadership, the Council on Diversity and Inclusiveness was redesigned to become the first elected council of faculty, staff, and student representatives with a designated budget. Rideout also played a key role in attracting Robert Wood Johnson New Careers in Nursing Scholarships to help attract underrepresented minority students. Rideout, a native of Pittsburgh, continues to serve as a pediatric advanced practice nurse at Golisano Children’s Hospital, caring for infants and children with ostomies. Caring for Infants with Ostomies What's New! A Child in Pain: How Can I Help? Is this Child in Pain? Tantillo, M., Marconi, M.A., Rideout, K., Anson, .A., & Reifenstein, K.A. (2017). Creating a Nursing Student Center for Academic and Professional Success. Journal of Nursing Education, 56 (4), 235-239. Rideout, K. (2011). Current and Future Needs of Accelerated Nursing Programs: Faculty Recruitment, Retention and Development. Accelerated Education in Nursing: Challenges, Strategies, Future Directions. Rideout, K. (2007). Evaluation of a PNP Care Coordinator Model for Hospitalized Children, Adolescents and Young Adults with Cystic Fibrosis. Pediatric Nursing. Rideout, K.; in J. Fox (ed.) (2002). Pediatric Pain Assessment and Management. Primary Health Care of Children, 2. Radke, K. & Rideout, K. (2000). Factors Related to Academic Performance of Nursing Students in a Graduate Physiology Course. Journal of the New York State Nurses Association, 31 (1), 11-16. Yoos, L., Malone, K., McMullen, A., Richards, K., Rideout, K., & Schultz, J. (1997). Standards and practice guidelines as the foundation for clinical practice. Journal of Nursing Quality Care, 11 (5), 48-54. Rideout, K.; in S. Miller and J. Fioravanti (eds.) (1997). Pediatric medication administration: Guidelines and techniques. Pediatric Medications: A Handbook for Nurses. Rideout, K. (1997). Pediatric Pain Assessment and Management. Primary Health Care of Children. Perkins, F., Jones, J., Rideout, K., Sax, H. (1996). Clinical Symposium: Post-operative pain management according protocols at the University of Rochester. Contemporary Surgery, 49 (2), 91-103. McMullen, A., Fioravanti, I.D., Pollack, V., Rideout, K., and Sciera, M. (1993). Heparinized Saline or Normal Saline as a Flush Solution in Intermittent Intravenous Lines in Infants and Children. MCN, 18 (2), 78-85. Radke, K., Adams, B., Anderson, J., Bouman, C., Rideout, K., Zigrossi, S. (1991). Curriculum Blueprints for the Future: The Process of Blending Beliefs. Nurse Educator, 16 (2), 9-13.